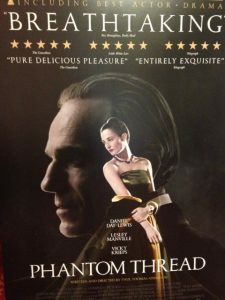 The movie is set in London’s glamorous 1950’s….. Fashion / London / obsessive designer -All the ingredients to spark my interest! Day-Lewis plays dress designer/couturier Reynolds Woodcock – a designer to the rich & fabulous! Woodcock is completely engrossed in his work and is equally obsessive, self indulgent and charismatic at the same time…. You completely believe this character is real, his every move is extremely watchable. The ‘House of Woodcock’ is a family affair; the artistic, clothes designing side is Reynolds and his team of fantastic seamstresses.. The day to day running and business side of the operation is headed up by Cyril, Reynolds sister – played by Lesley Manville. (quite a grim, character who is always there but doesn’t seem to have a life out-with the business & her brother) They have an extremely close relationship; he’s almost like the naughty little boy who looks up to his older sibling. Reynolds misses his mother who apparently was the one who taught him his craft at a very young age…. Reynolds life is surrounded by women – glamourous clients, his sister, their staff but he remains a confirmed bachelor; he has female companions but no one lasts…. Reynolds becomes bored or annoyed by their habits and conversation. All of his concentrations must go on creating beautiful gowns..
After completing one such creation for a special client, his sister Cyril suggests he take himself off for a visit to the countryside to their 2nd home; an escape from London…. She will join him later. Reynolds is at the local restaurant about to order breakfast when he is drawn to one of the young waitresses who is a little clumsy…. He orders a large, hearty breakfast from the young waitress and asks her out for dinner; she says yes. Alma is played by actress Vicky Krieps – I was trying to work out if she was German or Austrian – she’s actually from Luxembourg. It’s funny that there is no mention of how her character ended up in the UK? After dinner you see the couple whizzing through the countryside in Reynolds stylish sports-car and arrive at his country home… He asks her to model for him in his studio; his sister Cyril arrives – Cyril gives a knowing look as if to say, here’s the latest one… (she’s been witness to her brother’s ways for so long now..) Reynolds asks Cyril to take a note of Alma’s measurements…. He chooses the perfect shade of silk and creates a dress for her. She is now the ‘new muse’ in Reynolds life…. You can see Cyril already thinking ‘how long will this one last’? There’s a great scene, which to be honest is done with a lot of humour. The three main characters are sitting having breakfast, Alma is preparing her toast (crunch crunch) and pours herself some tea but does so in such a noisy way…. Reynolds is disgusted by the noise which puts him off his train of thought as he sits at the table, sketch pad to hand… An argument starts & Reynolds leaves the room. ‘Maybe you should have breakfast after Reynolds, his sister pipes up, or in your room’!! Will this relationship be doomed like all the others or will Alma stick up for herself and eventually get under the skin of the controlled designer…. I really don’t want to tell any more of the story as it takes a fantastic twist & there are some things best left as a surprise…. I always hate when a trailer for a new film is too long, just a couple of scenes is enough to grab your attention & get you to book up your tickets for it’s imminent release.. 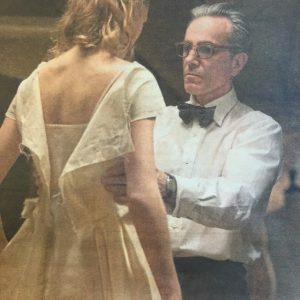 I absolutely loved this movie; the era, the story, and of course the quality of acting – Daniel Day-Lewis IS Reynolds Woodcock; I believed him……..
Is so worthy of your time & review!